However — look at things a different way. The time and energy that you spend on designing could be spent working in other areas of your business — the things that you’re really good at and enjoy doing. If you’re like me, you’ve heard this philosophy countless times — outsource what you don’t have time for or don’t enjoy. Spend time working on your business, not in your business. And, it’s incredibly true. When you’re a service provider especially, time is money. You trade hours for dollars. When you spend a few hours a week in Canva creating graphics for an upcoming launch or event, or in a DIY website builder like Wix making updates to your site, you’re spending the same hours that could be spent serving your clients, making you money. Your own business development is very important, just like your paying work, but you would actually save a lot of time, mental capacity (and therefore, money) if you would hire a pro who could take all of those extra tasks off of your plate. How does that sound? 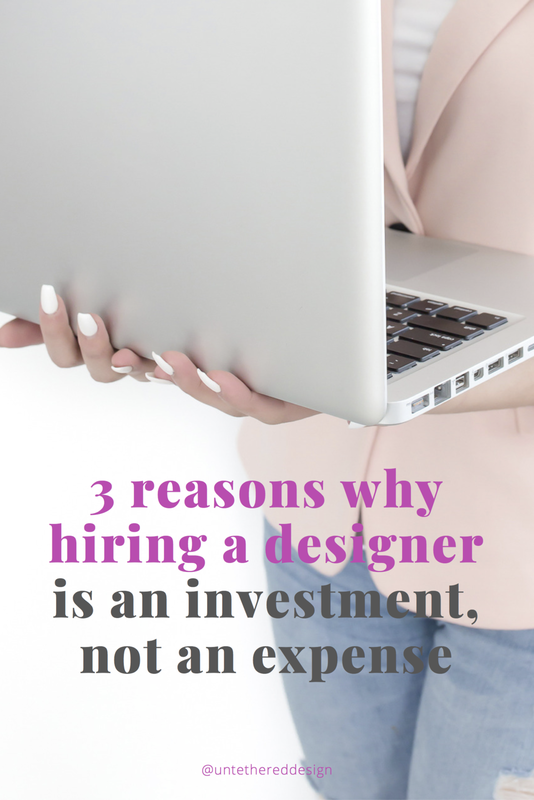 Here are (3) big reasons why you should look at hiring a designer to help you run your business — and why it’s an investment in the long run — and not “just another” expense. 1. A designer becomes apart of your team and understands your brand. When you hire the right designer, they become your dependable, go-to creative pro. Someone you know who you can always count on. This is something that I pride myself on, when working with my clients. A designer can become a creative extension of your team… a partner… and someone with whom you build a strong, long-term relationship. They are someone who you can trust and who knows your brand inside and out. They can master your look and feel… and most importantly, will keep things consistent and always looking professional. They can also stay on top of print and digital trends, bringing new ideas to the table, so that your overall brand identity stays fresh, modern and relevant. 2. You will save time and money. As touched on at the beginning, if you’re a service provider, you are trading hours for dollars. You only have so much time in the day. Wouldn’t you rather spend time getting client work done and other tasks that you enjoy (and will make you money?) When you’re DIY-ing graphics, it’s easy to get lost in a program, unsure of choosing fonts and colors, what file formats to use, how to download high-resolution photos and more — and before you know it, 3 hours have gone by and been lost. Instead, why don’t you rest easy knowing that your visuals are being taken care of in a timely fashion, with no issues, by someone who is an expert? 3. Your business will grow and look professional. Once you hire a designer, you have access to a pro who can turn around most any creative project that you can dream up. Whether you need a landing page for a new course that you’re launching, pins to be uploaded to Pinterest that ultimately drive traffic to your website, a brochure or flier to pass out at a local networking event or Facebook ads for a new campaign, your designer can create these deliverables quickly and efficiently — which allows you to show up across multiple platforms, several times a day. The more that you are visually out there, the more that you are seen and positioned as an expert at what you do. Professional visuals can more easily attract the right clients and customers. And again, because you’re not creating these materials yourself, you’re making more money in your business by getting your own work done at a faster pace and for more clients — and ALL of these things simply add up to more money in your pocket. As your brand identity continues to grow, so will your business. And, you will always look legitimate and professional — and taken seriously — because your branding is consistent and created by the same person time after time.